Known for their powerful sound and profound unity of ensemble, Ensemble Illume is dedicated to sharing the rich character of the viola, cello, and piano trio with audiences of all ages. With its unconventional instrumentation, Illume's mission is to nurture and expand the repertoire for the ensemble by identifying rarely-heard work and working with contemporary composers, while also pursuing collaborations with fellow musicians to perform quartets, quintets, and larger chamber ensembles. The ensemble was formed with an inaugural concert in San Francisco in 2018, which featured works by Kaija Saariaho and Johannes Brahms. The musicians of Ensemble Illume have made their passion for chamber music the core of their varied and busy performing careers, which have included performances on the stages of Carnegie Hall, Alice Tully Hall, Walt Disney Hall, Davies Symphony Hall, the New York City Center, the National Theater and Concert Hall of Taiwan, Auditori Teulada-Moraira in Spain, and through the airwaves of American Public Media, WNYC, WHYY, WQXR, WFMT, WAMC, and KALW. Taiwanese-American violist Jessica Chang is dedicated to sharing her love for music through presenting chamber music in accessible ways. As the founder and director of Chamber Music by the Bay, Jessica brings interactive concerts and programs to over 2,000 youth throughout the San Francisco Bay Area annually. 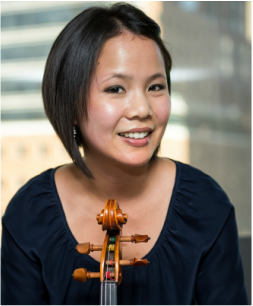 She has also served as violist of the Afiara Quartet, with whom she toured North America, including a visiting faculty residency at The Banff Centre in Alberta and residency as the Glenn Gould School Fellowship Quartet-in-Residence at the Royal Conservatory of Music in Toronto, Canada. She has been broadcast on NPR's “Performance Today”; performed at festivals including Festival Mozaic, Juneau Jazz & Classics, Bard Music West, Perlman Chamber Music Workshop, Aspen, Tanglewood, Verbier, and Taos; and featured as a teaching artist with Project 440 and the Savannah Music Festival. Jessica is a graduate of Yale, where she received her Bachelor of Arts degree with honors and distinction, holds an Artist Diploma from the Curtis Institute of Music, and a Master of Music degree from The Juilliard School. Her teachers have included Misha Amory, Michael Tree, Roberto Díaz, Steven Tenenbom, Heidi Castleman, Daniel Panner, Jenny Rudin, Jesse Levine, and Jodi Levitz. Jessica is based San Francisco, where she maintains a private studio, serves on the faculty of California Music Preparatory Academy, and performs frequently with ensembles throughout Northern California. ​As a frequent performer, educator, and presenter of cello and chamber music, cellist Laura Gaynon has performed in concert halls across the United States, Europe, Canada, and China. Currently based in the Bay Area, Laura performs with the American Bach Soloists, the Pacific Crest Chamber Players, the Magik*Magik Orchestra, and the baroque chamber ensemble Musa. As a chamber musician, she has collaborated with luminaries including Kim Kashkashian, Geoff Nuttall, Bonnie Hampton, Paul Hersh, and Ian Swensen. Laura is cofounder and coartistic director of Bard Music West in San Francisco. She is dedicated to promoting the music of today, and spearheaded Musa’s “Art Inspiring Art” commissioning project, now in its third year.As an educator, Laura has a private cello studio in San Francisco and directs the String Quartet Program at Thomas Hart Middle School in Pleasanton, CA. She is faculty at Chamber Music by the Bay, California Music Preparatory Academy and the Pacific Crest Music Festival. Laura holds degrees from Yale University and the San Francisco Conservatory of Music, where she graduated with a master of music in cello performance, an artist certificate in chamber music, and an emphasis in historical performance practice as a student of Jennifer Culp and Elisabeth Reed. Described as "brilliant" by the San Francisco Classical Voice, San Francisco-based pianist Allegra Chapman is dedicated to engaging with new audiences as performer, presenter, and educator. Allegra is founding Artistic Codirector and Executive Director of Bard Music West. She has performed at prestigious venues throughout the United States, Europe, and China, including Alice Tully Hall, the Dame Myra Hess Memorial Concert Series, the Bard Music Festival, the Liszt Ferenc Memorial Museum in Budapest, and Xi'an Concert Hall in Xi'an, China. Her performances have been broadcast on WQXR New York, WFMT Chicago, and KALW San Francisco. 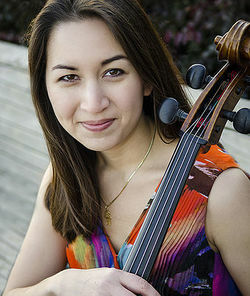 An avid chamber musician and passionate advocate for contemporary music, Allegra performs regularly with San Francisco Contemporary Music Players and UC Berkeley's Eco Ensemble, and has collaborated with members of International Contemporary Ensemble and the Eusebius, Orion, and Telegraph String Quartets. Allegra has also worked with many renowned living composers, including Joan Tower and Charles Wuorinen, and regularly premiers works of young composers. As an educator, Allegra enjoys a thriving teaching studio and has coached chamber music ensembles at many institutions, including San Francisco State University and Xi’an Conservatory of Music. As a faculty member at California Music Preparatory Academy, her student ensembles received top prizes in regional and national competitions. Allegra is currently a faculty member at MTSY Studio in Xi’an China. Allegra studied with Jeremy Denk and Peter Serkin at the Bard College Conservatory of Music, graduating in the inaugural class with degrees in piano performance and history. She continued her studies as a scholarship student at The Juilliard School where she earned her master of music degree with Seymour Lipkin and Julian Martin. Allegra previously studied with John McCarthy and has also worked with Dr. Sharon Mann at the San Francisco Conservatory of Music.